A moderate risk for severe weather exists across parts of the Carolinas and Virginia on Friday afternoon as squall lines capable of producing winds in excess of 70 MPH sweep across the region. It's been a long time since this part of the country has seen a moderate risk in an outlook from the Storm Prediction Center. Take today's severe weather threat seriously and make sure you've got a way to get warnings the moment they're issued. Today is the final day of a three-day severe weather outbreak across the southern United States. And intense squall line is expected to develop along the cold front extending off the low that's caused all the trouble for the last couple of days. Winds are ripping not too far above the surface, and it won't take much for a strong thunderstorm to mix those winds down to the surface. The Storm Prediction Center issued a moderate risk because of the chance for significant wind gusts in excess of 70 MPH, mainly across North Carolina and Virginia. In addition to the risk for significant wind gusts, tornadoes and (to a lesser extent) large hail are also possible. The best chance for tornadoes is over central North Carolina. Central parts of North Carolina and Virginia haven't seen a moderate risk for severe weather in an SPC outlook in a long, long time. Greensboro, N.C., hasn't been under a moderate risk since June 13, 2013. This is the first moderate risk in Raleigh, N.C., since February 24, 2016. You have to go back to September 2012 to find the last moderate risk in south-central Virginia. 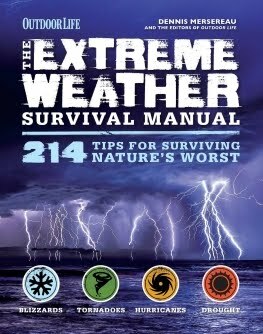 This is all to say that today is a day where you have to take the weather extremely seriously. All of the severe weather we've seen in recent years occurred on days with a lower SPC outlook than the one we've got today. 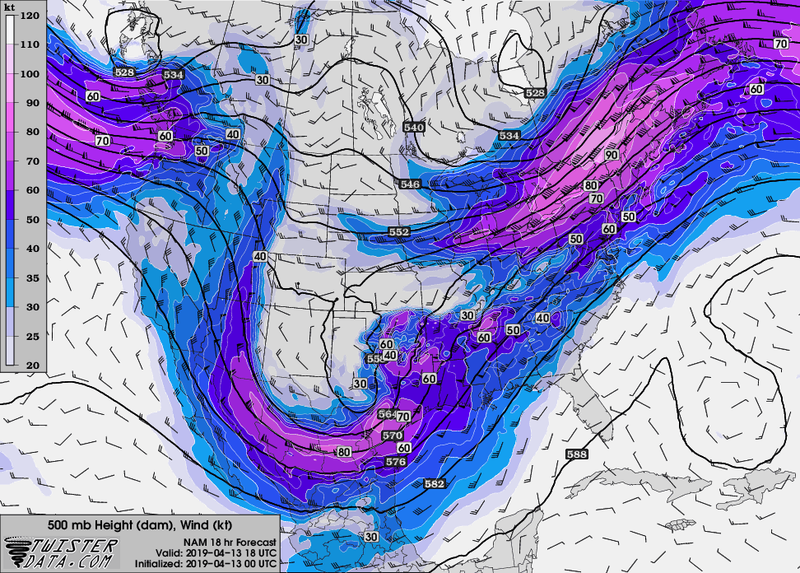 The dynamics are there to produce widespread and significant straight-line winds if storms are able to take full advantage of the environment available to them. 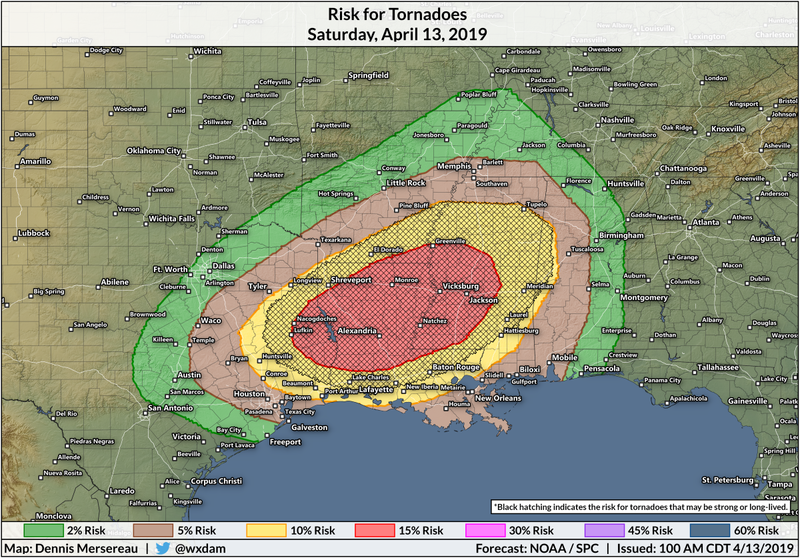 A risk for nighttime tornadoes—some potentially strong or long-lived—will unfold this evening and tonight across parts of southern Mississippi and Alabama. Damaging straight-line winds and large hail are also possible. Severe weather is dangerous no matter when it occurs, but it's especially threatening at night when people aren't paying attention or they're asleep. Thursday's severe weather risk is part of a multi-day severe weather outbreak that began Wednesday on the southern Plains. 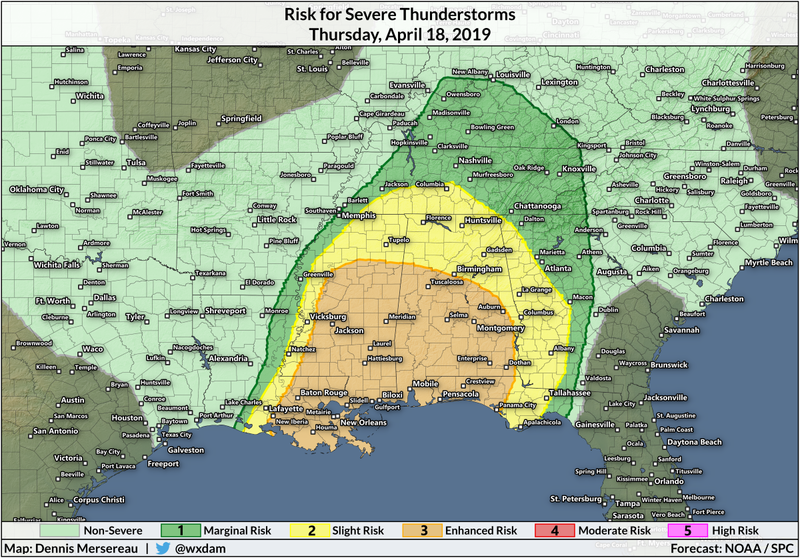 The system responsible for the severe weather will lead to the development of one or more rounds of severe weather that will affect parts of Louisiana, Mississippi, and Alabama on Thursday evening and overnight into Friday. A squall line was already underway at the time of this post's publication. The above radar image shows what the storms looked like at 3:30 PM CDT. 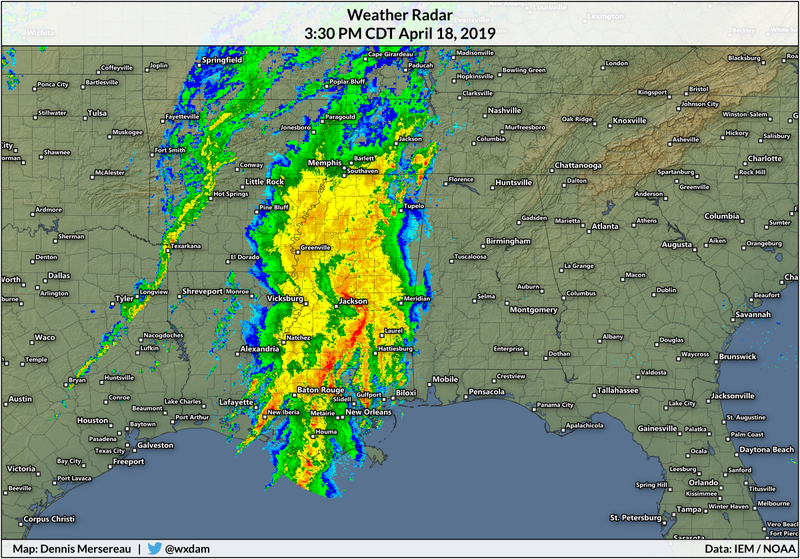 The line of storms moving into south-central Mississippi had a nasty bite to them, with severe thunderstorm and tornado warnings in effect for various parts of the line. All of this action will continue lumbering east through the evening and overnight hours. 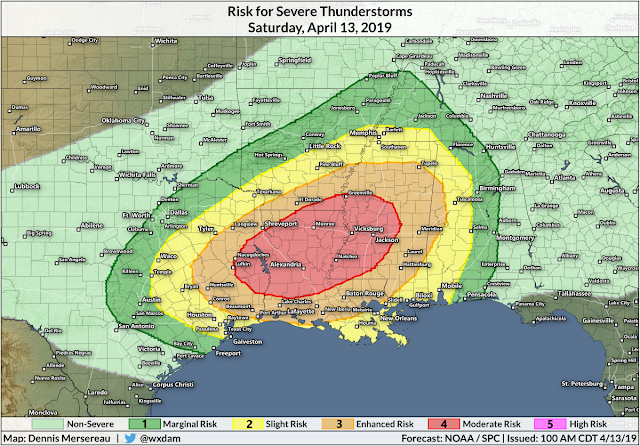 The greatest threat for severe weather covers much of the northern Gulf Coast, including New Orleans, Biloxi, Gulfport, Mobile, and Pensacola. The latest forecast from the Storm Prediction Center paints an enhanced risk for severe weather across these areas. 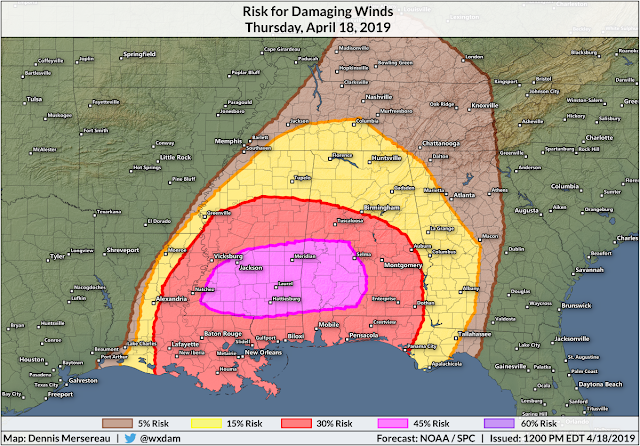 While this is the "bullseye" for dangerous weather, the threat for damaging winds, large hail, and isolated tornadoes extends much farther to the north toward Tennessee and Kentucky. The best dynamics for severe weather seem to be setting up over southern Mississippi and Alabama, as well as the western Florida Panhandle. 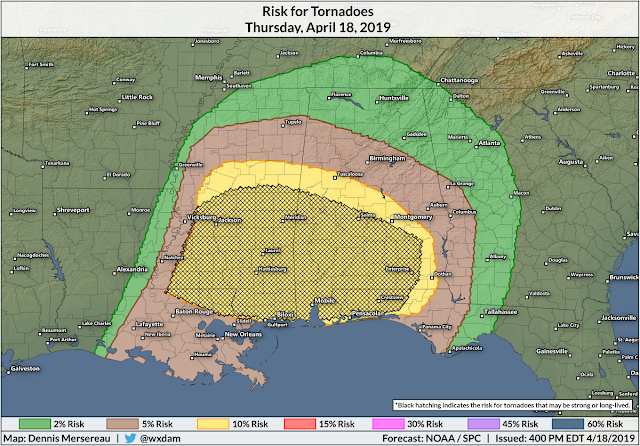 The SPC placed the areas under a 10% risk for tornadoes—a number that seems small, but is relatively large when it comes to tornadoes. The black hatching indicates the area where the atmosphere could support strong, long-lived tornadoes. Tornadoes are most likely in discrete thunderstorms that develop out ahead of the main squall line, though tornadoes are also possible embedded in the storms within the squall line. Embedded tornadoes can happen very quickly in a situation like this, cutting down the tornado warning lead time most of us are used to. Damaging winds can produce just as much damage as a tornado over a much wider area. The SPC seems particularly concerned about the risk for damaging wind gusts from one or more squall lines along a stretch from western Mississippi—including Jackson and the surrounding areas—through western Alabama. Nighttime tornadoes are terrifying because people stop paying attention to severe weather once the sun goes down and lots of people don't have a reliable way to hear warnings once they're asleep. If you're in the areas at risk for severe weather tonight, stay aware and get prepared for dangerous thunderstorms overnight. You won't see the tornado coming when it's dark and the tornado is wrapped in rain. Tornado sirens are outdoor warning systems that are not meant to be heard indoors. Your weather app may not alert you to a tornado warning in time, either, especially when the storms are moving quickly and every second counts. Check to see that the "emergency alerts" are activated on your mobile device. The Wireless Emergency Alert System—the system they tested on the national level last year that freaked everyone out—delivers a push notification to your device direct from the National Weather Service the moment they issue a warning. The system triangulates your location based on your cell signal to determine if you're in a tornado warning. It works. It's saved lives. The threat for severe weather will shift east tomorrow and stretch from the Mid-Atlantic to the Florida Peninsula. I'll have a post on that later this evening or tomorrow morning. The powerful winter-but-not-really-winter storm cranking across the Plains and Midwest this week is still producing heavy, thunderous bands of snow as the storm starts to wind down and finally lift toward Canada. Many folks noted that the blanket of white was a little more off-white than they're used to. 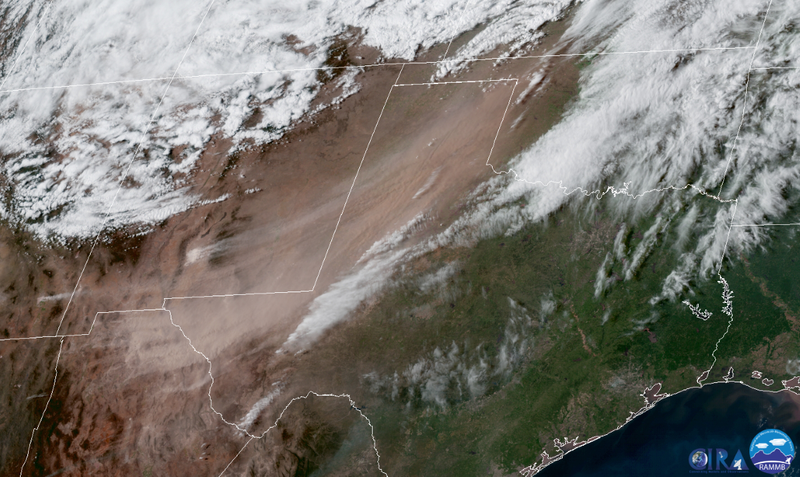 The sprawling storm resulted in such windy conditions in the southwestern United States that the subsequent dust storms traveled across the country and tinted the snow as far north as Minnesota and Wisconsin. 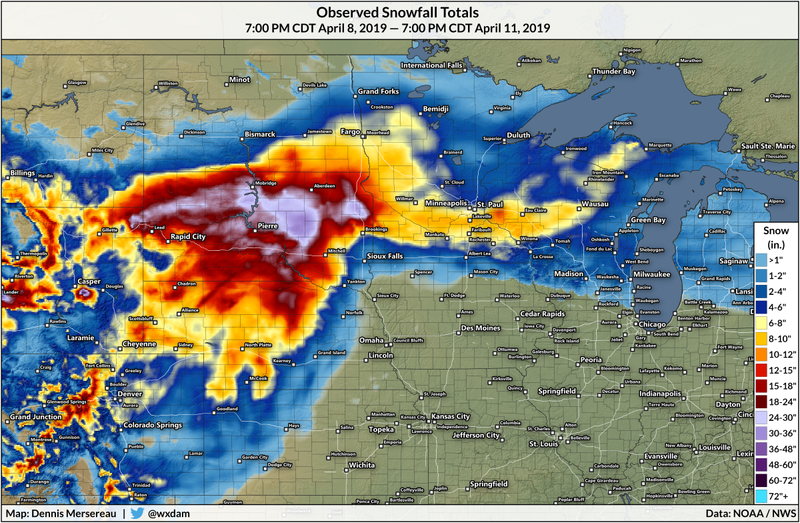 A record-breaking blizzard continued to produce heavy snow on Wednesday night across the northern Plains and Upper Midwest. A significant portion of South Dakota has seen more than two feet of snow from the storm with more to come. That would be an impressive snowfall total at any point in the winter, let alone near the middle of April. The storm—often called a "bomb cyclone" in the news because it underwent bombogenesis, or rapid strengthening—isn't all about the snow. Folks on the southern end of the storm dealt with raging winds as the storm ramped-up across flat terrain. These strong winds, gusting at times to 60-70 MPH, picked up a ton of dust as they blew over the Chihuahuan Desert. This lofted dust raced northward through the day on Wednesday and got ingested into the storm system overnight. By Thursday morning, pictures started emerging on social media of tan-tinted "dirty" snow showing up in places like Minnesota and Wisconsin. It turns out that the dust wound up accumulating on the falling snowflakes—and even likely serving as the nucleus on which the snowflake could form—once the layer of southwestern air reached the moisture and cold air on the northern side of the system. Airborne particulates like dust get ingested into weather systems all the time, though it usually involves liquid precipitation. It's common to see a dirty rain develop after a major dust storm, volcanic eruption, or wildfires. A map of storm total snowfall predicted by local NWS offices, issued Tuesday evening. This will be a significant and disruptive snowstorm for a large swath of land between Colorado and Ontario. 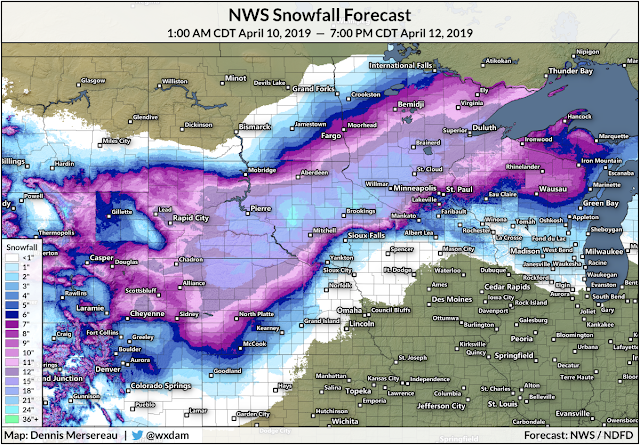 Precipitation will fall in the form of snow across most of the northern expanse of the storm, likely producing more than a foot of snow from central Nebraska through to the western shores of Lake Superior. Communities looking at 12"+ of snow include Rapid City, Pierre, St. Cloud, and Duluth. Timing: Snow is already falling across parts of the central Rockies tonight. Wintry precip will quickly pick up in coverage and intensity on Wednesday morning as the storm develops and strengthens. A blizzard warning is in effect for the Denver metro area from noon Wednesday until noon Thursday. The heavy snow will overspread the northern Plains and Upper Midwest on Wednesday night and continue through Friday morning, gradually ending from west to east. Amounts: A sharp temperature gradient along the track of the storm, both at the surface and aloft, will mean there's a sharp cutoff between significant snowfall totals and not much of anything at all. This is a particularly unnerving scenario because Sioux Falls, Minneapolis, and St. Paul are all straddling that line between a nuisance snowfall and a crippling blizzard. Any southward jog in the track of the storm will force the heavy, sustained snowfall farther to the south and into the heart of these cities. Some communities will see monthly snowfall records from this system. The most snow ever recorded during the month of April in Pierre, South Dakota, was 13.4" during the April of 1986. This storm could top that. The most snow recorded for the month of April in Duluth, Minnesota, was 12.7" set back in...well, last year. The latest NWS forecast shows this storm easily topping that with close to a foot-and-a-half of snow. The big story with last month's storm wound up being the immense flooding that engulfed entire towns in the days and weeks after the storm. Major flooding is likely after this storm, as well, though probably not on the scale we saw last time around. The snow that falls this week will be heavy and wet. 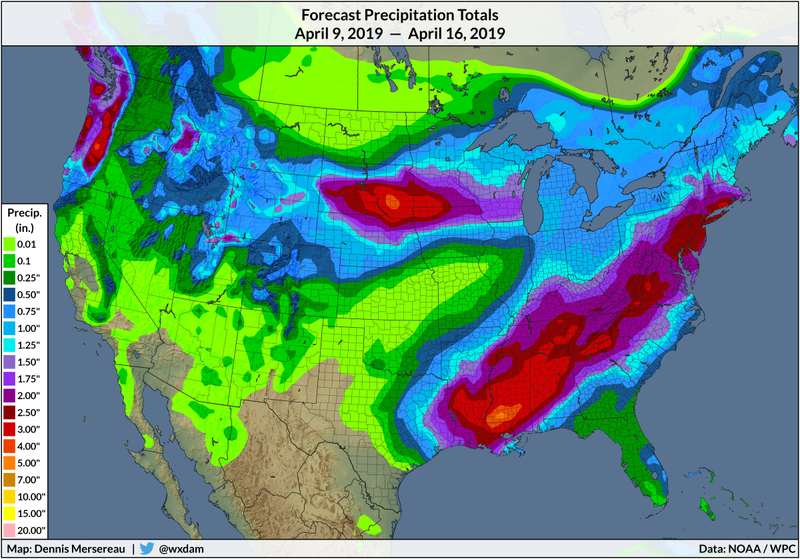 The latest precipitation forecast from the Weather Prediction Center shows 3-4" of liquid-equivalent precipitation falling across the hardest-hit flood areas through the end of the week. Once the snow starts to melt, many rivers will again begin to overflow their banks and lead to major flooding in the surrounding areas. Several rivers in the region are already at moderate or major flood stage. The National Weather Service expects most gauges along the Red River in North Dakota, James River and Big Sioux River in South Dakota, the Mississippi River from Minnesota on down, and many other smaller waterways in the region to experience moderate or major flooding in the next week because of the impending surge of rain and snow. The situation shouldn't be quite as severe as we saw last month—only minor and moderate flooding is in the forecast in Nebraska—as the bulk of the precipitation will be farther north than it was in March and the ground isn't frozen anymore. The frozen, impermeable ground, along with forced the vast majority of the water to run off into waterways, exacerbating the flooding. As you'd expect to see with any strong storm system and that kind of temperature gradient, there's a chance for severe thunderstorms along the storm's track on Wednesday. 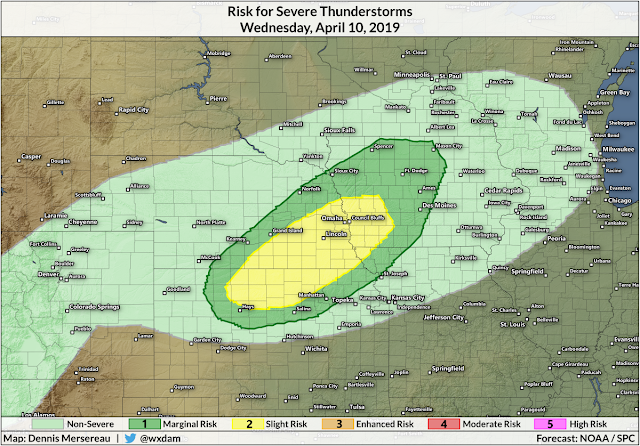 The dynamics aren't the greatest due to the relative lack of moisture accompanying the warmth, but conditions will be favorable for severe thunderstorms with the risk of large hail and some damaging winds. An isolated tornado or two is possible in a situation like this, the best chance for which would be right around the warm front. 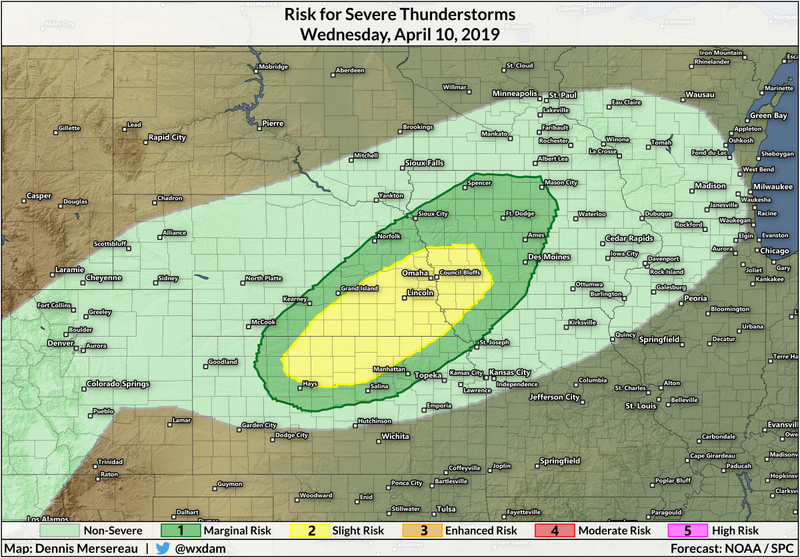 The chance for severe weather will shift to the other side of the Mississippi River on Thursday afternoon, where severe thunderstorms that develop along the advancing cold front could bring damaging wind gusts to parts of eastern Illinois and western Indiana. A strong storm wrapping up on flat land is a recipe for high winds. (I think I typed that exact sentence with the last one, come to think of it.) 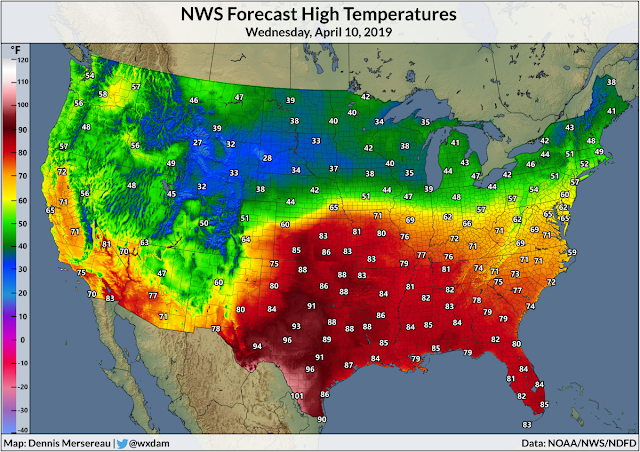 High wind warnings and wind advisories are up for much of the Southwest and southern Plains in anticipation for wind gusts of 60-70 MPH when the storm cranks up during the day on Wednesday. The combination of high winds, dry air, and warm temperatures will lead to a high fire risk across parts of New Mexico and far western Texas during the day on Wednesday. as far north as Greensboro, while it was just pretty to look at closer to the Virginia border where I live. The snow was mostly conversational and didn't cause too many problems thanks to warm ground temperatures and air temperatures that mostly stayed above freezing during the event. Charlotte only dropped to 36°F during the heaviest precipitation. 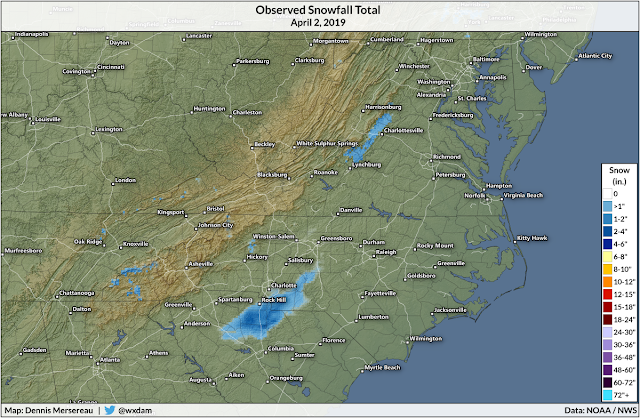 It's not common to see accumulating snow this far south this late in the year. 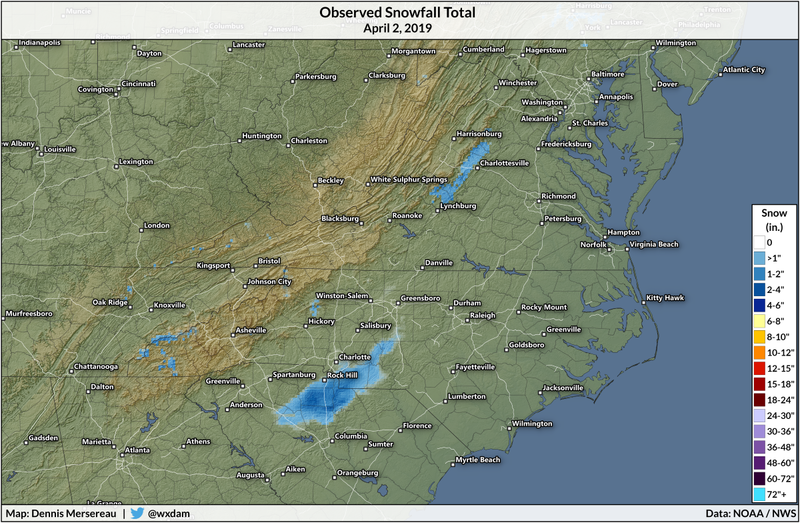 This is just the second time in the past century that Charlotte has seen measurable snow during the month of April. 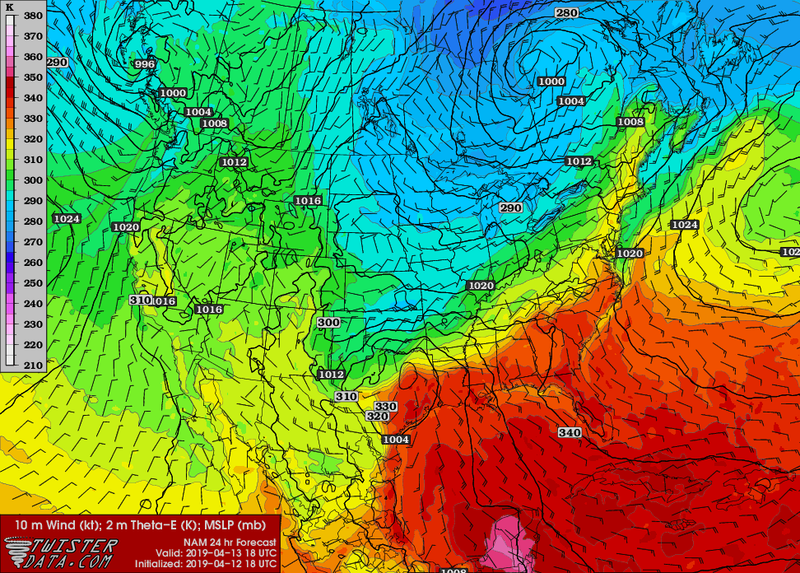 Winter weather usually comes to an end across the Carolinas by the middle of March, though there are some exceptions. Parts of North Carolina saw accumulating snow during the second week of April last year, followed a few days later by a severe weather outbreak. Things got even more interesting once the storm fully exited the North Carolina coast. The low-pressure system that would go on to become a full-fledged nor'easter quickly got its act together this afternoon thanks to a sharply tilted upper-level trough and favorable winds in the jet stream. Meteorologists started buzzing on social media this evening while watching the radar out of Morehead City, NC, as a squall line with multiple embedded supercells played out a few dozen miles off the Outer Banks. Those thunderstorms actually wound up helping the low-pressure system deepen even faster than it would have otherwise. For a couple of hours this afternoon, this storm strengthened in part through the same processes that fuel tropical and subtropical cyclones. Strong updrafts in the thunderstorms near the center of the low pulled lots of air away from the surface, causing the minimum central pressure to deepen more rapidly than it would have otherwise. NOAA's Weather Prediction Center put it succinctly this evening: "[the storm is] a good reminder that cyclones exist along a continuum and that determining their type (extratropical, subtropical, or tropical) isn't always clear." New England will see some gusty winds and a cold rain on Wednesday morning as the bulk of the storm passes the region to the east. Atlantic Canada will feel the full brunt of the storm as it makes landfall in Nova Scotia on Wednesday evening. Environment Canada has warnings out for wind gusts as high as 60 MPH along Nova Scotia's southern coast and 2-3 inches of rain across the province through Thursday. The storm will be somewhat kinder to New Brunswick and Prince Edward Island, bringing an inch or two of cold rain with some heavy snow possible on the western fringe of the storm. in Yoder, Colorado, located a few dozen miles east of Colorado Springs. The home exposed to the full force of the winds roaring over open fields without any trees, terrain, or other buildings to act as a buffer. The record low air pressures and wind gusts were exciting to follow, but the biggest story was the intense, record-breaking flooding kicked off by the storm. The storm's warm temperatures and heavy rain chewed away at the snowpack across the central Plains and Upper Midwest, leading to weeks of intense flooding that's gone on to devastate communities and enormous swaths of farmland. NOAA predicts the major flooding will continue through the spring. 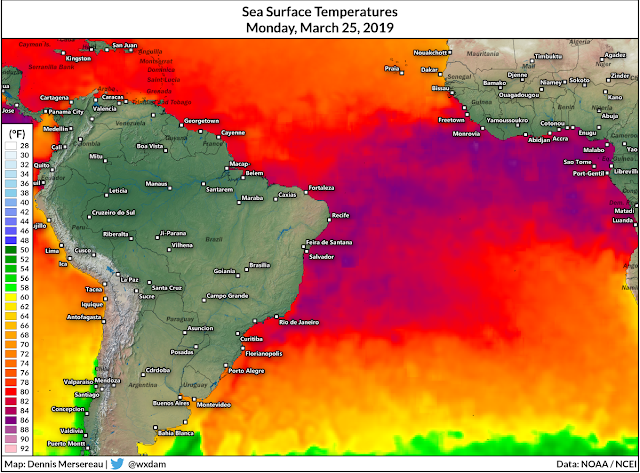 A rare tropical storm formed off the southeastern coast of Brazil this weekend, a difficult feat for the hostile atmosphere over the southern half of the Atlantic Ocean. 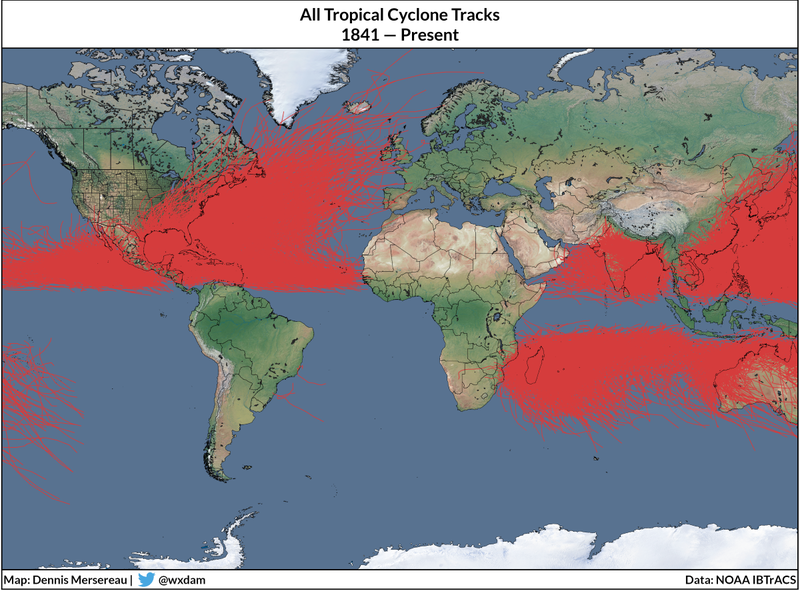 Tropical Storm Iba is one of just a handful of tropical cyclones to form in this part of the world in the era of modern weather observation. The storm will pose no threat to land. Iba is right around its peak intensity at the time of this post, packing maximum sustained winds of about 50 MPH with higher gusts. Wind shear has displaced most of Iba's convection off to the southeast of the center of circulation, which has been exposed for most of the storm's existence. The tropical storm will dissipate over open waters in a day or two. The South Atlantic Ocean is conspicuously devoid of tropical cyclone activity compared to the northern half of the ocean. While the water gets warm enough to sustain tropical cyclone development, the region lacks other ingredients necessary for storm development. Tropical waves pumping off the western coast of Africa are the driving force behind bustling hurricane activity in the northern Atlantic. These disturbances seed tropical cyclone development if they root themselves in an environment favorable for strengthening. We don't see these seeds for development across the South Atlantic, which doesn't leave many opportunities for tropical cyclones to form. Strong wind shear across the region rips apart any clusters of thunderstorms that try to take root, shutting them down and preventing further development. Tropical Storm Iba managed to form thanks to reduced wind shear, warm waters (sea surface temperatures on Monday are pictured above), and thunderstorms that managed to persist long enough for a surface low to form and keep the system going. Iba is a full-fledged tropical entity. It's not exactly pretty, but it's a whole lot of something for a region where these storms don't really happen. Brazilian weather authorities chose the storm's name because tropical cyclones are so rare in the southern Atlantic Ocean that there's no official naming convention for the basin. Tropical Storm Iba is just the third official tropical cyclone to form in this part of the world since reliable records began. You can see from the map above just how rare storms are around the South America. NOAA's official record of past tropical cyclone tracks shows just three storms in the South Atlantic Ocean. The first in the list is Hurricane Catarina, a full-fledged hurricane that shocked meteorologists in March 2004. The storm strengthened to the equivalent of a category two hurricanes with 100 MPH winds before making landfall in Santa Catarina, Brazil. Tropical Storm Anita, a minimal and short-lived system, developed in March 2010 around the same area as Catarina. The third storm on that map is Subtropical Storm Arani, which formed in June 2011. There have been many more subtropical storms (not listed in the official record) in the years since then—the healthiest of which was Subtropical Storm Bapo in 2015—but Iba is the first truly tropical entity since Anita in 2010. March seems to be the best time of the year to see a system like this...not that we have a large sample to go on, of course. Late March in the South Atlantic is roughly equivalent to late September in the northern hemisphere—a time where the ocean has reached its maximum summertime heating.